1. Heat smoker to 250 degrees. You could use many different types of wood for this, although we usually use hickory, pecan, or apple. 2. Cut the top off the jalapeno pepper. Core the pepper to remove the seeds and membrane. 3. Mix together the cream cheese and grated cheddar. 4. Fill the cored peppers with the filling. 5. Take some of the sausage meat and wrap it around the pepper. Make sure none of the pepper is visible. Roll it so that it is in the shape of an egg. 6. Place on the smoker and cook at 250 degrees for about 2 hours or until the internal temperature of the sausage reaches 160 degrees. If you notice cheese starting to bubble out of the eggs, it is likely done. Grill Method: Set up grill for indirect heat and bring up to 325 degrees. 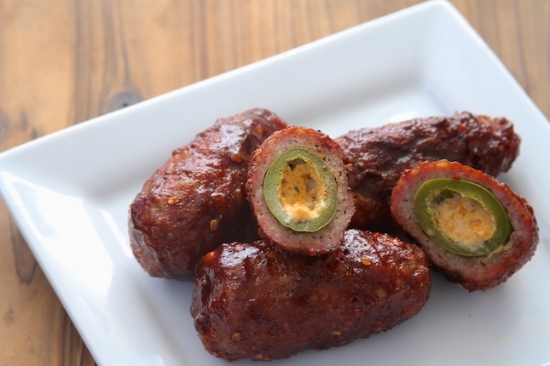 Place armadillo eggs on the indirect side and cook for about 30-45 minutes.